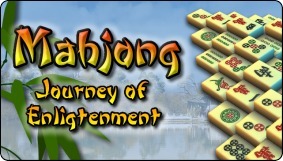 Mahjong: Journey of Enlightenment - a journey of fun begins! Click the thumbnails above for a larger picture. Embark on a new mahjong journey in this remarkable twist on a classic game. Featuring an "Adventure mode" and the all-new "Free-Play mode", plus over 1,000 hidden items to find! Can you unlock all the items and complete the journey? Over 1,050 secret items to be found, including 1,000+ layouts! New "Free-Play" mode lets you play all the items you unlock. Challenging gameplay; race against the clock to win. Hundreds of hidden tilesets, backgrounds, layouts and more. Beautiful graphics and special effects. 500 Mhz, 32mb RAM, Windows 98/ME/2000/XP, 3D accelerated graphics card, DirectX 9, 6mb Hard drive space, an Internet connection. Ultimate Mahjong - a more traditional, but excellent Mahjong game.